Dr. Deugwillo was born and raised a Maryland native, growing up in Baldwin. She began riding at age ten, and competed for the University of Maryland during her college years. In 2009, Dr. Deugwillo graduated from UMD with a Bachelor’s degree in Animal Science with an equine emphasis. After moving to Kansas, she received her doctorate degree in veterinary medicine from Kansas State University College of Veterinary Medicine in 2013. 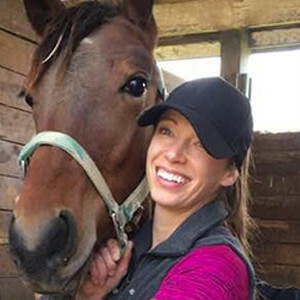 After graduating, she moved to southern California to complete an intensive internship in equine medicine, surgery and emergency and critical care at the Chino Valley Equine Hospital. In 2014, Dr. Deugwillo began a theriogenology and neonatal care internship at Hanover Shoe Farms where she fell in love with Standardbreds. Outside of work, she enjoys hiking with her boxer, swimming, and running the trails around Winbak Farm.